What Are My Upper Deck Sports Cards Worth? You have shoeboxes full of trading cards just sitting in your garage, basement, attic or closet, but you do not touch them. Your father told you not to as that would affect the value. He was always adamant about hanging on to them since his mother threw his cards away. Are they worth something? Who knows? You haven’t touched them in ages and with the holidays coming up, maybe it is time to bring them out and see what they are worth. Here are some tips on how to assess the value of your cards. Remember the old Beckett books that would tell you the pricing? Well those still exist and you can grab them at your local card shop or visit their website and look up the values online. There is a charge to the online service. The only problem is the values do not always represent what they cards would sell for today. Beckett certainly provides a good starting point, but there are other options to get more current and regional pricing on your collection. I would recommend picking up one of the monthly publications first to and looking through pricing on sets you knew you have. Do any big prices jump out at you? Do you recognize any cards you had? By running through the guide prior to starting, you’ll likely get a good feel for which cards you want to watch out for. Beckett price guides are still around and can be a helpful tool to get a good feel on the value of your collection. Once you’ve familiarized yourself with some of the key cards to look for, set aside an afternoon or a couple evenings where you can really dive into your collection. If you have thousands of cards, you are not going to want to price them all out, you just want to look for some of the better cards and get a feel for what you have. Get your cards in an area where you can spread them out and go through them where they will not be disturbed in the event you need to take a break. Maybe have some family members or friends help as well, you’ll find it can be a lot of fun going through them together. Quickly scan through them for some of the bigger names you know and especially cards you remember being valuable. You may have placed those in cases or sleeves to protect them. As you start to separate them, pay attention to the condition of the cards. It is important to realize that cards with rough edges, centering issues, creases or fuzzy corners will all be valued less than their mint condition counterparts. Try to categorize them in terms of condition while you go through them. Also keep on the lookout for rookie cards, autograph cards or other special looking cards. Those tend to carry premium values to them. 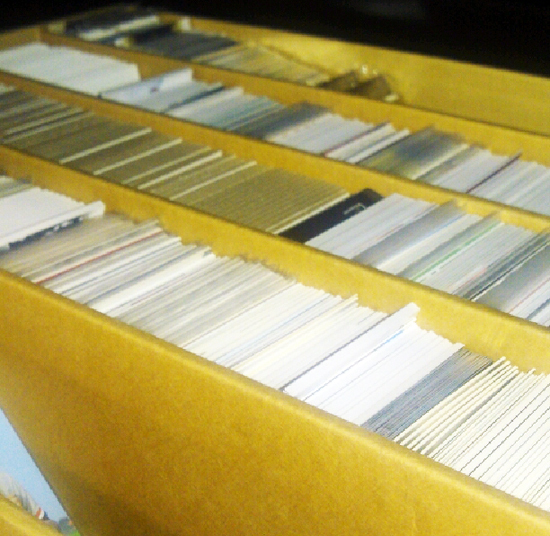 Diving into boxes of cards can be a daunting task, but it can be a lot of fun as well. Probably the best way to see what single cards are worth is to go where most single cards are sold; eBay. Once you have signed up for a membership, you will be able to view completed auctions to see what similar cards to what you have sold for. That will give you a very accurate feel for what specific cards are currently selling for today. Another great option is to visit your local card shop. Many will specialize in appraising trading card collections so don’t be afraid to call ahead and ask about appraisals and how much they charge for those services. You can also do this at trading cards shows coming through your area, but there are not as many as there used to be. You may find you have a situation where some of the cards you have are so limited and rare that you just cannot find pricing information on them. While Upper Deck cannot provide pricing details on what cards currently sell for, you can ask our community of savvy collectors by posting images and details of your collection to the Upper Deck Facebook page. You may even find some fans who are interested in purchasing them from you there. You will likely find you do not have enough to retire early on unfortunately, but as you go through them, hopefully it helps you remember what you really loved about them. It wasn’t really the values as much as it was how they made you feel. How they brought you closer to the game you loved. How they made you feel about the players like the rookies who never panned out and that one rookie that did. Maybe the experience of going through the cards will bring you back to collecting and if it doesn’t, just know there are other options besides selling your cards on eBay, to a dealer or a collector. Think about donating some to a local Boys & Girls Club to share that experience you enjoyed so much with others. There is another great charity called Cards to Kids that specializes in getting cards into the hands of kids for you. Any donation to charities like these is a tax deduction and we all could use a few more of those. On a last note, I feel inclined to share that I sold the vast majority of my childhood collection through a variety of channels as I went through college. Most of my cards were from the 1980’s so I actually sold them off at a good time before people realized how mass produced they were causing values to plummet. Once I started working at Upper Deck I didn’t really find it necessary to restart my collection as I felt a closeness to the cards and hobby every day I walked in the office. One Christmas not too long ago my father gave me a crudely wrapped present of some cards he found of mine that I had not sold and it really brought on a rush of fond memories. I still have that small box and look at it from time to time. I’m glad I still have some of my original collection and wouldn’t part with it. If you are considering selling all your collection, make sure you hang on to a few of your favorites. You’ll be happy you did. I was set up at a 1988(it was either late 1988 or early 1989) Wanda Marcus Card Show in Dallas Texas when this nice man came by and introduced himself saying he was starting a new card company called Upper Deck. He handed me a Wally Joyner Upper Deck Promo. It looked great. I asked him what was the suggested retail price on the product. He said, “Ninety-nine cents.” Since this was double what Topps, Fleer, and Donruss were going for, I answered, “I don’t know how many people are willing to buy packs at ninety-nine cents.” Boy, was I wrong! 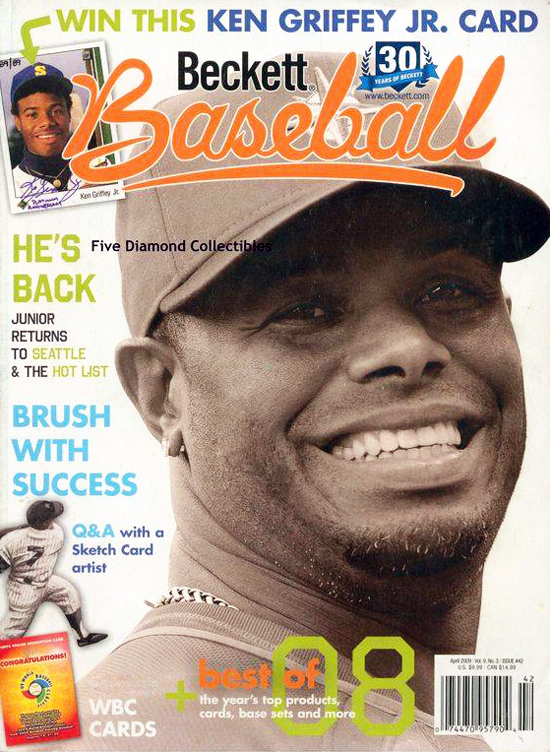 1989 was marked by the Ken Griffey, Jr. craze and people were looking for his best rookie card. Of course, that was the Upper Deck Griffey RC. Back then there was no difference between retail and hobby boxes. I found myself running to every retail outlet, buying boxes at $35 per box and selling them for $54 at card shows (I didn’t open my store until 1992). I was allowed to open up an account with a wholesale magazine distributer who also was the retail sports cards distributer for all of South Texas. Timing is everything. 1990 Upper Deck Baseball arrived at this wholesale retail product distributer before any of the hobby shops received their shipment. The next day I took my 15 cases of 1990 Upper Deck Baseball to a 300 table card show in Houston, Texas. I was the ONLY DEALER with 1990 Upper Deck Baseball at the show. I cleaned-up and the Big National Dealers were &#@*&! The huge success of Upper Deck marked a historic change to the hobby. Upper Deck was the leader and the other card companies were scrambling to come up with new and better products. The rest is history. Why would you have a guy in Texas talk about hockey cards and show a year old Beckett? What is the difference on the 01-02 Datsyuk #422 rc between the purple and white board version ? Value ? I have so many hockey card those we always orders in 80’s and 90’s we still have them . What we can do with it? I have a full set of upper deck hockey carder from the year Gretzky was traded. It has the last Oilers & the 1st Kings Jersey he was in. It’s in a collectable sleeve jacket book. Any clue what it’s worth? Have a set of excellent condition Michael Jordan upper deck SP authentic anyone interested in helping me get more info on these cards??? I have a signed 1997 upper deck silver Michael Jordan autograph Air Time arrival and departure basketball card I have a signed 1997 upper deck silver Michael Jordan autograph airtime arrival and departure basketball card. Does anyone know what it’s possibly worth? I have an American Football Coaches Association venue program from 1970 when Paul Dietzel was the president. The event was held in washington d.c. in 1970. On it I have the autographs of Paul Dietzel, Joe Paterno, Vince Lombardi all together on the same page above one another. What kind of value does something like this have. The condition is excellent. I have a complete set of 1994 Upper Deck Collectors Choice SILVER that nobody can seem to give me an accurate value. all cards are NM state. Anybody have an idea as to their worth? Should I open my 10 packs of 1993 series two upper deck baseball cards? What are they worth unopened?